The Thunderstruck II video slot is set in the Norse mythology. You will be acquainted with the Viking gods Odin, Thor, Valkyrie and Loki in this very exciting slot machine from Microgaming. Thunderstruck II includes a lot of nice features like the randomly triggered Wildstorm feature and a great free game feature where you will enter the mighty Valhalla in the Great Hall of Spins. Thunderstruck II is a 5 reeler with the 243 pay line system where wins are awarded, left to right, in adjacent symbol combinations. 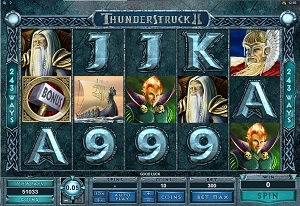 Microgaming presents a very entertaining video slot with Thunderstruck II that let your imagination wonder off to the ancient gods of the Norse mythology. The graphics in Thunderstruck II is great. The design captures a very suitable feel for the Viking theme of this game. The symbols of the lower paying symbols resemble the Nordic rune stones that were raised by the Vikings across the Nordic regions. The music in this game is very dramatic, especially in the free games, which puts a suitable feel to the theme. The main game carries a less dramatic sound experience which increases the closer you get to the bonus features. The gods Odin, Thor, Valkyrie and Loki each have their own symbol in the main game. There are also a few Viking symbols such as Valhalla and the legendary Viking ship that carried the Vikings across the seas. The lower paying symbols are 10,J, Q, K and A. The wild symbols is the Thunderstruck II logo which substitutes for all other except for the scatter. Thors Hammer is the scatter and three or more of this symbol will trigger the free game feature. This game has no Gamble Feature. The random triggered Wildstorm feature will award you extra pays when it appears. The free game feature is triggered by hitting three or more scatters on the reels. The Hall of Spins feature will sequentially unlock further bonus feature where each of the four gods represents one level of the feature. The Valkyrie feature will be unlocked the first 4 times you trigger the free games. Valkyrie gives you 10 free spins. The next level of free games is unlocked from the 5th time you trigger the feature. Loki will award you 15 free spins. Odin will give you 20 free spins and will be unlocked on the 10th time you trigger the feature. Thor awards you 25 free spins and is available in the free game feature from the 15th time you manage to trigger the Great Hall of Spins feature. Thunderstruck II has 5 reels and uses the 243 pay line concept. You may bet as low as 0.01 currency credit per spin. The maximum bet is 1 currency credit.